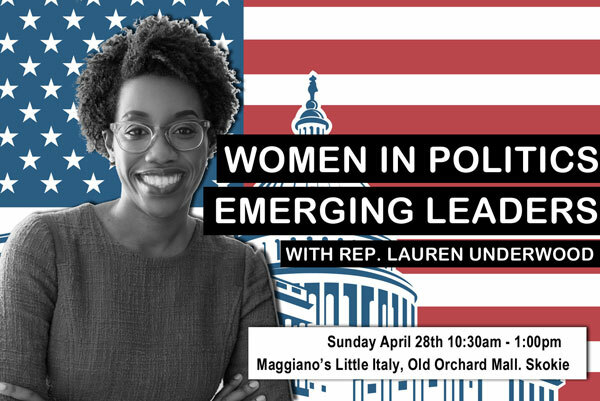 We are having brunch and a discussion with Rep Lauren Underwood (IL-14) at Maggiano's Sunday April 28th 10:30am to 1:00pm and you are invited! We are proud to have participated in Rep. Underwood's campaign in 2018. Events like this keep the lights on at the DPOE Church St office so we can continue to fight. Thank you for your support. By clicking on the "Continue" button you confirm that the following statements are true and accurate: I am not a foreign national who lacks permanent residence in the United States. This contribution is made from my own funds, and not those of another. This contribution is not made from the funds of a corporation or labor organization. This contribution is made on a personal credit card or debit card for which I have the legal obligation to pay, and is not made either on a corporate or business entity card or on the card of another person. I am at least eighteen years old. Contributions or gifts are not tax deductible.